Yesterday, while trying to address a note on a near-finished animation, I discovered the need for a new tool in my Node Sets toolbox that was both useful and trivially simple to create. A rare combination when it comes to my code. The original intended use for the Node Sets tagging tools was that animated nodes would be tagged as you work and, when you need to adjust an animation's timing, you would run the "Show Nodes" command to open all of the tagged nodes. The idea being, you'll need to open not only the nodes that need to be adjusted, but also all of the other relevant animated nodes for timing and context. The problem I encountered involves this methodology's inability to scale with the modularity of larger projects. One of the main benefits of a node-based workflow is the ability to create any number of blocks of operations, separate from the main process tree, then connect and combine them as necessary. Each of these blocks would have its own set of animated nodes, building a piece of the overall animation. But the comp I was working on yesterday had 140 tagged animated nodes and, while it would technically still work to open all of them every time I need to make a timing change, it's slow and unwieldy to have 140 node property panes open at the same time. A solution I proposed to this issue in the v1.0 blog post was the ability to use a different tag for different types or groups of nodes and open them each independently. A fine idea that I never personally implemented because the tags are hard coded into the tool and there's no way to add more tags without closing the app, modifying the menu.py file, and cluttering up the toolset with a lot of similarly named tools. A terrible workflow. A solution that solves this problem in a much simpler, smarter way is to use a selection of nodes to narrow the search for tags. 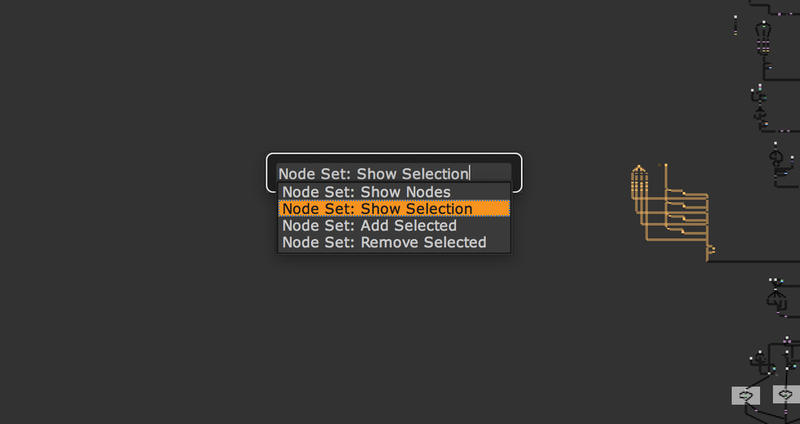 So, when working on a smaller section of the animation, I can select a block of nodes and run the new command "Node Set: Show Selection" to open the tagged nodes contained within. The selected block of nodes used to search for tagged nodes. Like I mentioned at the top of this post, the code for this new addition was exceptionally simple. Specifically, I duplicated and renamed the "Node Set: Show Nodes" code, and changed one word. In the function's for loop, I changed nuke.allNodes() to nuke.selectedNodes(). And that was it. Writing this blog post has already taken several orders of magnitude longer than writing the code. It's rare that the solution to an issue I encounter while working is so simple to create that it's quicker to just make the tool than capture a note to create it later, but that was the case with this one and I'm very happy to have this new option. Head over to the Downloads page to get the full updated Node Sets v1.2 code. 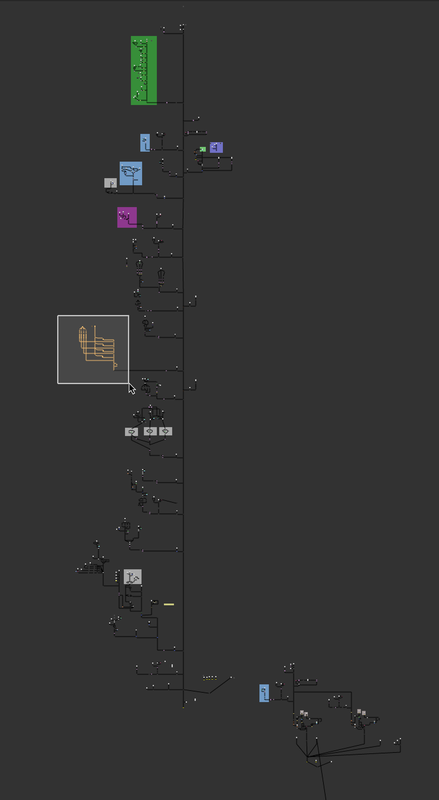 Since creating the Node Sets for Nuke toolset back in June, I've been using it like crazy on all of my projects. Which has led to the discovery of one incredibly obnoxious bug. This is where you set the maximum number of node properties panels that can be open simultaneously. I usually keep mine set to 3 or 4. When I open a node's properties panel, if I already have the maximum number of panels open, the oldest panel, at the bottom of the list, is closed and the new panel opens on top. Which is great. Unless, of course, you're trying to simultaneously open an unknown number of properties panels, all at the same time. When using the Node Sets tool for showing all nodes in a set, I would have to manually set the maxPanels number to a value greater than or equal to the number of nodes I'd already tagged, prior to running the command. Since I usually have no idea how many nodes are in a set, I end up setting the maxPanels property to something I know is way too high, like 35. That way, when the Show Nodes in Set function runs, I won't be left looking at only 3 of my tagged nodes. But since the Show Nodes in Set command is already searching through all the nodes to see which ones are tagged, wouldn't it be great if it could keep a tally as it searches and automatically update the maxPanels property to match? Yes. That would be nice. In addition to updating the showOnlyChosenNodes() function, I've also renamed the actual menu commands to all start with Node Set:. This way, I can start a tab+search with the same three letters, nod, and quickly narrow results to the only 3 tools that fit that criteria; my Node Set tools. 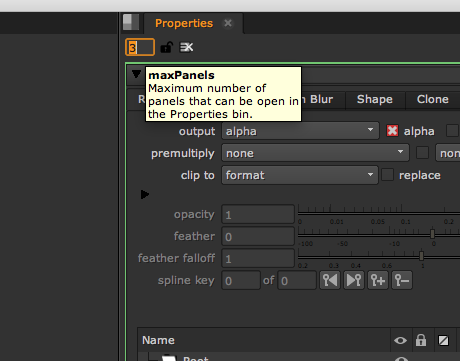 I love using Node Sets in Nuke and I'm glad to finally be rid of this annoying workaround. UPDATE: A newer version of this plugin exists here. The story goes like this. It may sound familiar. 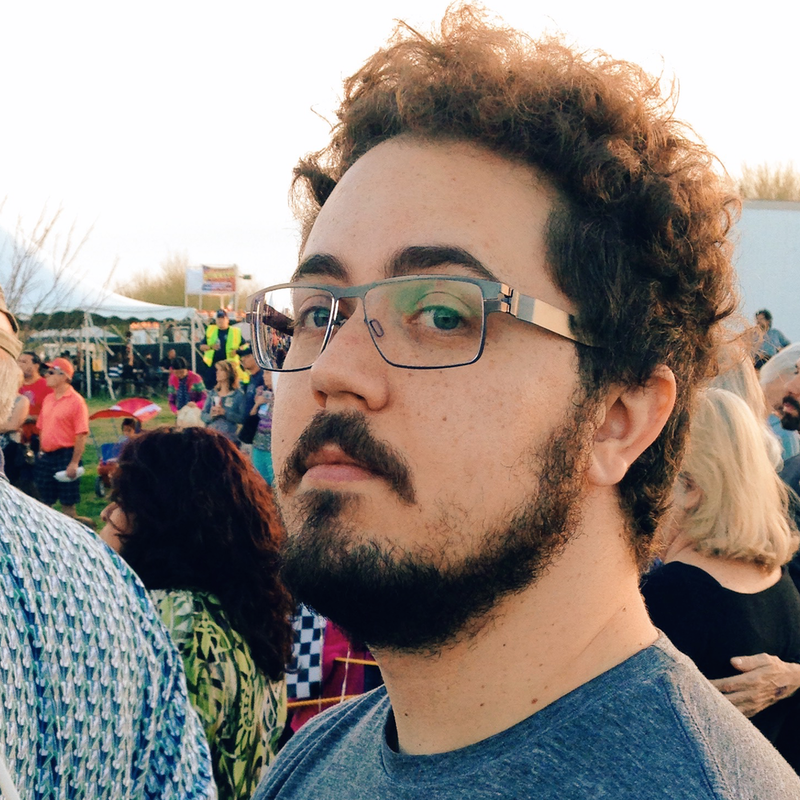 You're working on an animation in your favorite node-based compositing application, and you want to make a timing change. The first half of the animation is perfect, but it should hold a little longer before it finishes, to better match the background plate. Problem is, you've got animated nodes all over your script, and all of their keyframes need to move in sync. Transform nodes, Grade nodes, GridWarp nodes. 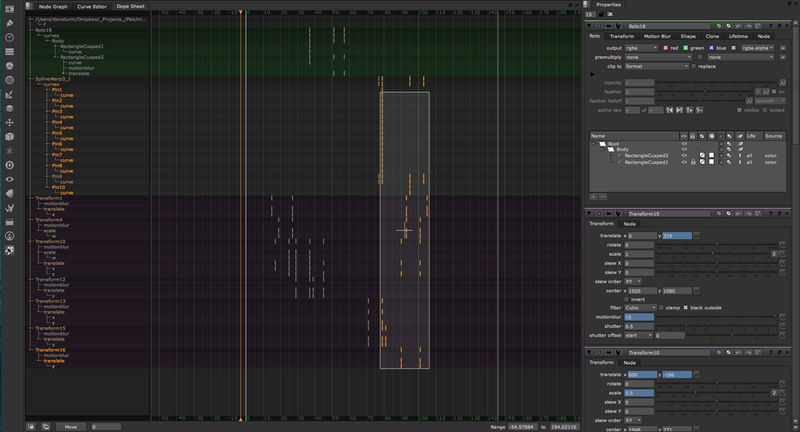 You zoom in and move around your script, looking for nodes with the little red "A" in the upper right corner. No, not that node. That one's for that other asset and it doesn't need to move. Okay, got 'em all open? Now switch the the Dope Sheet, grab everything after frame 75 and slide it to the right a few frames. Done? Let's watch the new timing. Oh, here it is. Wait. How many frames did the other 6 nodes move? CMD+Z. CMD+Z. CMD+Z. CMD+Z. CMD+Z. CMD+Z. Okay, are they all open this time? Good. Now slide them all together. 10 Minutes And 20 Additional Nodes Later. Well...now I need a little less time between frames 30 and 42. This is the annoying scenario I found myself repeating about a dozen times on a recent project, so I sent an email to The Foundry's support team, requesting the addition of a feature I described as "Node Sets". A Node Set is an arbitrary collection of nodes that can be opened all at once with a single command. New nodes can be added as the script grows, or removed if they're no longer needed. For those of you who don't speak Python, allow me explain what's happening here. Once added to your Menu.py file, the script creates 3 tools in a new menu within Nuke. Just as I requested, I have the ability to add or remove selected nodes from the group, then, when I need to make a change, open all of those nodes with a single command. What the script is actually doing is tagging the nodes. No, Nuke did not suddenly or secretly gain the ability to add tags to things, it's cleverly using the label section in the Node tab to hold the inNodeSet text. The Show Nodes in Set command simply scans all the nodes in your script for nodes with inNodeSet in their labels, and opens them. Simple. Smart. As a result, yes, you can add the inNodeSet text to the label field manually, rather than using the new menu command, and the Show Nodes in Set command will find it, but who would want to do such a barbarous thing? Here's where my tools now live. I do this for one major reason; having these tools available in the Tab + Search tool. For those unfamiliar, Nuke has a built in tool similar to Spotlight or LaunchBar that allows you to press Tab then type the name of the tool you're looking for, avoiding the need to have keyboard shortcuts for every type of node. This being a bit of a hack, there are naturally a few limitations. First and foremost, using this tool will delete anything you already had in the label field of a node. I doesn't support the ability to add a tag to the text in the label field. The tag has to be the only thing in the label field. Secondly, once you realize how useful this is, you may want to have more than one Node Set at your disposal. The good news about this current limitation is that you can very easily create as many node sets as you want by duplicating the code and changing the inNodeSet tag to something like inNodeSet2. Of course, with multiple node sets, it'd be ideal if you could include a given node in multiple sets at the same time, but like I mentioned, this is not a real tagging system. If real tagging ever makes its way into the application, I imagine such a thing will then be possible. I emailed my pal Jake again, telling him how much I appreciate his work on this script, and you'll never guess what he did. He sent me an updated version of the script that adds the tag to the node label without overwriting the current text in the field. Not only is this great for general usability, it means we can add a node to multiple Node Sets at the same time. We now have a real tagging system built into Nuke. How great is Jake? Seriously. One thing I will note; if you are planning on using multiple Node Sets, you'll want to change the default tag to inNodeSet1. If you leave it as inNodeSet, it will also show up in results for other tags, like inNodeSet2. If it wasn't clear before, all credit for this script goes to The Foundry and their awesome support team. They continue to be one of my favorite companies, specifically because they offer great support in addition to their great products. I'm incredibly happy to have this annoyance removed from my workflow, and I hope you are too.